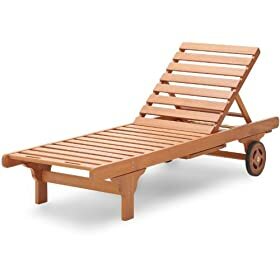 This handsome, well-made chaise is tailor-made for soaking up the sun or relaxing by the pool. A unique tray table extends to hold drinks, magazines, and other lounging essentials, then slides back underneath for storage. The back adjusts to five positions--from fully-upright to completely-reclined. Matching cushions can also be purchased to add even more comfort. The chair's slotted surface allows rain to flow through, rather than collect and damage the wood. Rust-resistant hardware and mortise and tenon construction add to the piece’s strength and durability. Crafted from durable, Earthy-friendly eucalyptus hardwood, this furniture is intended for outdoor use in all weather. 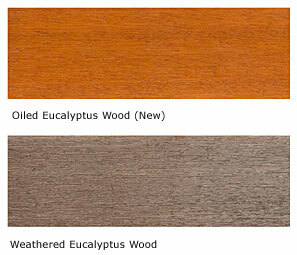 A beautiful hardwood comparable to teak and with excellent weather-resistant properties, eucalyptus is dense and naturally resistant to rot and insect infestation. Certified by the Forest Stewardship Council (FSC), there is no doubt about the responsible production and consumption of this wood. The rapid growth of eucalyptus trees makes them more readily available and more easily affordable. In addition, furniture constructed of eucalyptus is light enough to move easily and requires no oiling unless to maintain a desired look.